You are here: Home / Author Articles / It’s here! The Elihu Yale Story! The story of Elihu Yale as you’ve never heard it before! It was a chance meeting. Our local Wrexham MP Ian Lucas asking me if I’d ever thought of writing a story about our local historical celebrity, Elihu Yale. Yale has a very fine and famous tomb in the grounds of St. Giles Parish Church and is taught to Wrexham school kids as the philanthropist who bequeathed some of his wealth, and his name, to help found one of the world’s most famous universities, in New Haven, Connecticut. But I knew enough else about Yale to understand that, while he may have been the original nabob, he also made much of his wealth through the Indian slave trade – and thus he didn’t interest me much as a protagonist for a novel. But life’s never that simple and, out of respect for Ian’s own interest, I decided to dig a bit deeper. It’s a curious thing, writing historical fiction. Definitely an element of karma about it at times and this was no exception, for I almost immediately, and almost by accident, then stumbled on a copy of Elihu Yale’s will, sent to me from the National Archives. And a remarkable document it turned out to be. This entry, a single line: To My Wicked Wife… And then? Nothing. No bequest. Not even her name. Simply a large blank space. So who was she? And why so wicked? 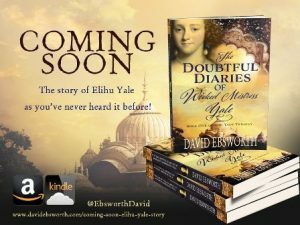 1721, and elderly Catherine Yale discovers that her second husband Elihu has left her nothing in his will except the slur of naming her a “wicked wife.” True, her private journals are filled with intimacies: her inner thoughts about life in Old Madras, where the East India Company’s intrigues are as complex as any in the Mughal Emperor’s court; about the conflicts she must endure as a mother now to the additional children she conceives with Elihu; about her role as a spy for the political factions determined to prevent a Catholic succession to the English crown; and about the realisation that she is now wed to a husband she is quickly coming to despise. 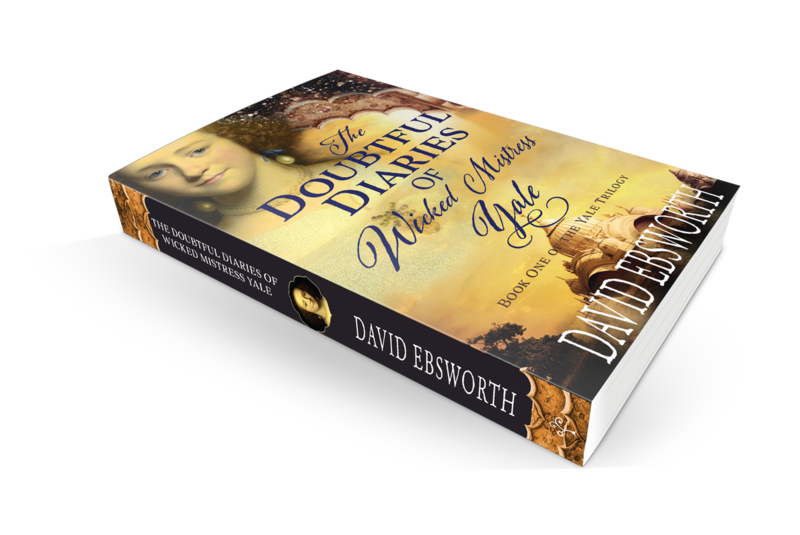 Yet these past fifty years, since the early days of her short and tragic first marriage to darling Joseph, the diaries have been kept safe and secret. Or have they? Perhaps it’s time to read them afresh, to go back before the days when Elihu first betrayed her, before she was betrayed also by the East India Company women who should have stood at her side – before she wreaked her own special revenge on them all. A lot of the story is pure fiction but all Catherine’s family background is authentic. The novel, my seventh, is now available thanks to a successful crowd funding campaign in which readers were able to pre-order copies. That’s nothing new, of course. It’s exactly how writers like John Milton and Mark Twain (plus countless other authors between the 17th and 19th Centuries) always worked. They had to fund their own books, Paradise Lost and The Adventures of Huckleberry Finn, through ‘subscriptions’, taking pre-orders to cover the publication costs. I like to write historical fiction in a particular way. To bring some lesser-known but important periods and incidents to a wider public. In this case the story of nabob philanthropist Elihu Yale yet a very different story from the one we think we know. Yale the Indian slave trader. Yale the philanderer. Yale the usurer. But apart from raising the publishing costs, crowd funding for authors like me has another serious advantage. It’s great to have people “invest” in the book by ordering copies in advance, because this is proper market-testing, proving that there’s real interest in the story. And, just like the subscription books of old, those who help to see it published get the recognition they deserve by having their names listed in the Acknowledgement sections of the book itself. The second novel in the trilogy, Wicked Mistress Yale, The Glorious Return is due for publication in late-autumn 2019, and picks up Catherine’s story with her return to a London turned upside down in 1689, while the third part, Wicked Mistress Yale, The Parting Glass, is scheduled for release in mid-2020.